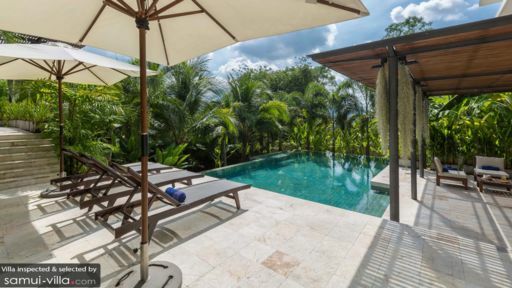 Villa Santika is a traditional and modern holiday retreat near the famous Bophut area in Koh Samui. 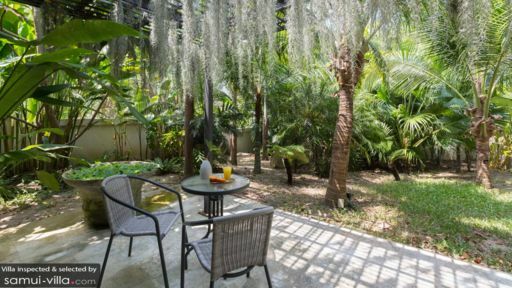 Surrounded by intriguing things to do and see such as at the historical Fishermans Village and the revelry at Chaweng, the villa manages to provide its guests with a uniquely serene and luxurious experience. 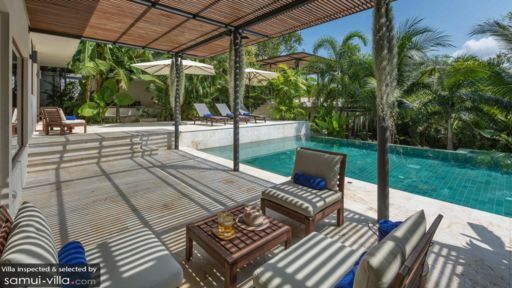 The villa comprises five, well-designed bedrooms located over two levels as well as spacious living and dining areas, a media room, and finally, a stunning swimming pool outdoors. You have everything you need right at here at Villa Santika for the fulfilment of your tropical fantasies. The five bedrooms at Villa Santika are unique, luxurious, naturally well-lit owing to large glass windows, and comfortable furnished with king-sized beds. The largest bedroom features a stunning and covetous window seat that is cushioned and cosy overlooking hills of green, verdant flora, and vast skies. Featuring wooden flooring, polished modern furniture, and shades of powdery blue and cyan, the bedrooms are better equipped to serve you with a completely and utterly comfortable setup with daybeds, plush seating, and hearty views. The air-conditioned bedrooms have access to four equally luxurious bathrooms fitted with shower areas, bathtubs, modern fittings, and windows with a view. The privacy compound of Villa Santika is the ideal setup for an undisturbed holiday away from the bustling streets. The 10-metre turquoise swimming pool is as inviting as you would expect especially nestled amid verdant foliage. Ensconced within the verdure of the gardens, this outdoor space also comprises a pergola-roofed lounge area with plush seating to enjoy some fresh air while catching up with loved ones. Another relaxation area is found on the terrace with more seating and even better views of the gorgeous sun-streaked skies. Alfresco dining is accessible to guests for a commemorative experience dining in the open with fresh air and luscious surroundings. Glass doors lead to the spacious, contemporary, and tastefully designed living area at Villa Santika. A blend of modern and traditional Thai interiors will leave you in awe of this beautiful space done up in all-white accents sprinkled with splashes of colour here and there. A few steps down and you will land at the sunken seating with a massive L-shaped sofa built on a raised platform. Large glass windows allow ample views of neighbouring greenery. A complete entertainment system is available upstairs at the media room with a 55-inch TV and hi-speed internet. You can give instructions to Alexa as well to play your favourite music. Work, play, and rest at Villa Santika’s plentiful and air-conditioned lounge areas as there is more than one. Pick your corner and enjoy your time. The indoor dining area is equally comfortable with a cushioned bench on one side and chairs on the other. There is seating for ten guests comfortably. Lastly, the fully-equipped kitchen is preceded by a breakfast counter and white high stools. The kitchen is state of the art with sleek fittings, modern appliances, and much more. Proud to offer first-class services and amenities to guests, the friendly and discreet staff at Villa Santika will make your stay even more satisfactory and memorable. From housekeeping to security, they take care of everything. You can alter the housekeeping time as per your requirement as they’re conducted in the morning. For special services such as Thai cooking classes, Muay Thai, massages, and transportation, the staff can make any arrangements as these are charged additionally. Found in central Samui close to the major attractions on the island including the historical Fishermans Village, and Bophut, Villa Santika provides easy access to most of what Samui is known for. There are high-end boutiques, cafes, and fine-dining restaurants on Chaweng Beach while you can hit the surf breaks, sunbathe on the beach, and try out the local delicacies nearby.